For all the choices, it’s surprisingly hard to find a portable antenna for HF that is affordable and practical. A portable antenna does not have to be an epic quest. In this article I’ll discuss a few options and then give detailed instructions on how to make a super-easy, super-cheap HF antenna-to-go that really works. My last portable antenna was two hamsticks in a dipole configuration (here is a great general overview article about hamstick dipoles, from my buddy over at Prepared Ham). Hamsticks are monobanders, so I had to lug along a separate set of sticks for each band I wanted to use, plus a tripod and mast. A band change involved taking the whole deal down, changing out the sticks, and hauling it back up. Although it worked quite well as an antenna, all that hardware took away from the “portable” aspect of the project. I then tried some home brew dipoles made with thin 22 gauge wire (which is fine for QRP). They also worked very well and lightened the load, but I still needed an antenna for each band and a tripod/mast to hold it up. There had to be a better way. Why not just buy a commercially made portable antenna? There are literally dozens of “plug and play” portable antennas on the market, and the path of least resistance would be to buy one and be done with it. I did consider a manufactured portable antenna until I dug a little deeper and was turned off by the details. Most of the the portable antenna kits such as Chameleon and Buddipole actually do work fairly well. That’s not the problem. My issue with these antennas is that they use proprietary plugs, cords, and parts that cannot be readily repaired/replaced, or are easy to loose. I could be knocked off the air at a really bad time because some weirdo nonstandard part of my portable antenna is busted or lost. It does not stop there. An off the shelf portable antenna can be expensive! One particular model really impressed me and had good reviews…but it would cost close to $900 for everything I need to operate 10-40 meters. There was also the “tactical dipole” for $480, and another $211 antenna that consisted of sixty feet of wire and a matching transformer. Almost $500 for a freakin’ dipole? Seriously? Who buys this stuff? After digging through numerous antenna books and online resources, I decided on the good old fashioned random wire. It fits all the requirements on my wish list and has an efficiency at least equal to an expensive factory portable antenna. The random wire antenna has been around as long as radio itself; what I am going to show you here is by no means a brilliant new invention. The basic design is the same as it was 100+ years ago. A random wire is a compromise portable antenna. In exchange for simplicity and low cost you give up operational space, meaning, the antenna is small and lightweight for storage but when deployed it will take up a lot of linear feet. You will need an open area large enough for the entire run of the wire. Also, an antenna tuner is required. A tripod/mast is not required if there is a tree or other structure to support the antenna. Positioning the random wire portable antenna may be challenging depending on what is available to hold it up. In my setup, I have two tripods to hold up each end plus a slotted PVC pipe to support the droop in the middle. When I can get away with it, I leave that stuff behind and just string the wire up in a tree. If you will be using your random wire portable antenna at a known bugout location, campsite, summer property, etc., it would be worth your while to scout out an installation spot ahead of time. When using high power (100 watts or so), the exposed metal on the radio and connected equipment may have RF “hot spots”. This is normal. Hot spots are very uncomfortable to the touch but are usually not a serious safety hazard at the standard 100 watt power level. Hot spots can be mitigated somewhat by a good ground and/or counterpoise. If you are operating QRP (low power), then hot spots should not be an issue. 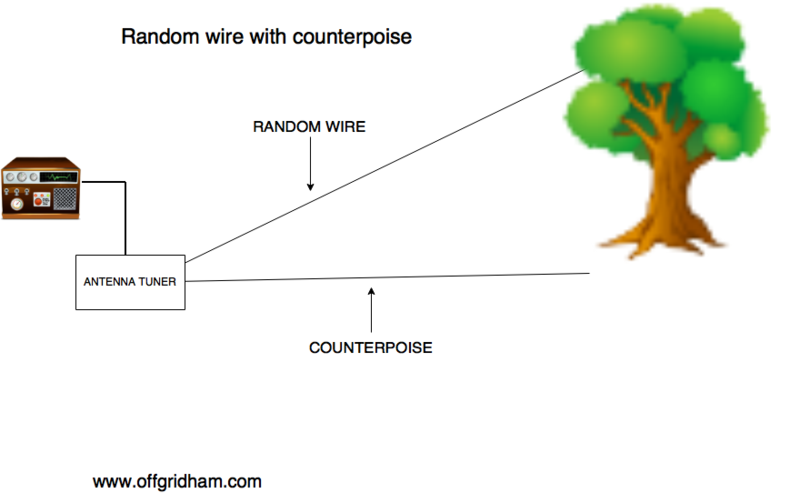 Should random wires really be random? There is disagreement over how long a random wire should be. Some sources claim that certain specific lengths should be avoided due to resonance issues. But if a wire is cut to be a certain size, or to avoid a certain size, then it’s not really “random”, is it? I believe the data is inconclusive. The only criteria I suggest is that your random wire should be at least 50 feet or greater than ½ wavelength at the lowest frequency you plan to use. The goal is to get enough copper in the air to send and receive a decent signal. My portable antenna is somewhere around 75 feet (I don’t know exactly) and works great from 40 to 10. There are three versions of the random wire antenna. You may not need all these items depending on what version you are making. 14-16 gauge stranded wire (minimum 50 feet or ½ wavelength at the lowest frequency you will use), plus extra for a counterpoise. If you will be running QRP only, you can use wire as small as 22 gauge. Details about the parts & materials. Stranded wire is strongly recommended. There is nothing functionally wrong with solid wire, but it is stiff and hard to work with. You’ll be sorry when you want to pack it for transport. An antenna tuner is required for all versions of the long wire antenna. If your radio has a built in antenna tuner, it’s possible that it will be unable to load up a random wire. Basic external antenna tuners available for well under $100. The MFJ 16010 is specifically designed for random wire use and they offer a QRP-specific antenna tuner too. I personally use an LDG Z-817. It costs a little more but it is fully automatic through the accessory port on my FT-817. I push one button and within seconds I have a perfect match to the antenna. A unun is a matching transformer used to convert the unbalanced impedance of the long wire close to something the antenna tuner can work with. It is not the same as a balun (more about this in a moment) . Version 1 of the random wire portable antenna (below) is the easiest and cheapest, but it’s also the least effective and the most likely to create “hot spots”. Using the male banana plug, terminate the wire into the center contact on the output SO-259 of the antenna tuner. That’s right…there is no coax, the antenna feeds directly into the antenna tuner. Then, connect the ground lug of the tuner to your ground rod. All you need to do now it load up your wire and go. The reason this antenna is inefficient and not recommended is because there is no RF ground or counterpoise. The earth ground is not an effective ground for transmission purposes, so you literally have only half of an antenna. This antenna should be your last choice of the three options presented here. The second version of the random wire portable antenna (below) is the same as version 1, except the earth ground is replaced by a counterpoise. The counterpoise simply lays on the ground underneath the antenna and is also a random length. It does not have to be the exact same size as the antenna, although it helps if it is. 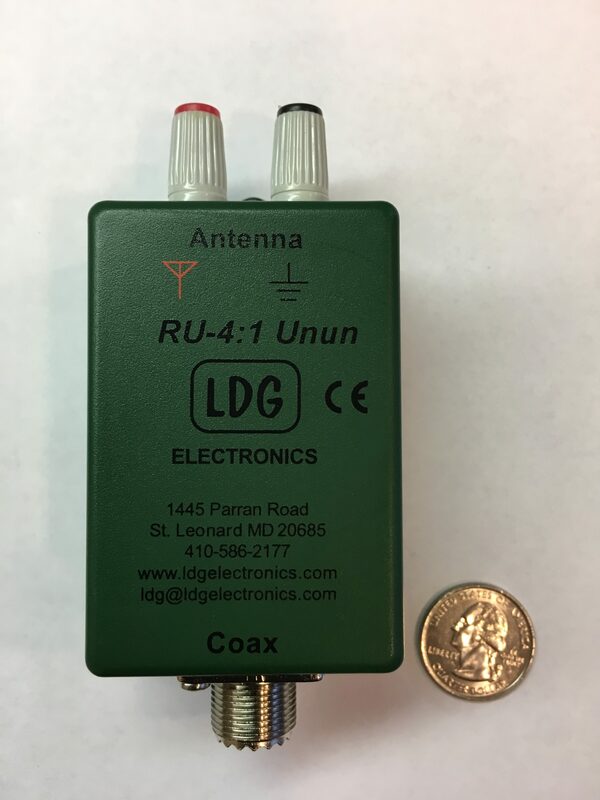 The third and last version of the long wire portable antenna uses a unun so that you can connect the antenna to the tuner with coax. This is especially helpful when it is not convenient to have the radio located near the antenna. The counterpoise connects to the ground side of the unun and lays on the ground parallel to the antenna wire, just as in version 2. This is the antenna I use the most and it works great. My counterpoise is about 50 feet (for an approximately 75 foot antenna) and I can reliably work domestic DX and occasionally foreign DX with only five watts output from my FT-817 radio. 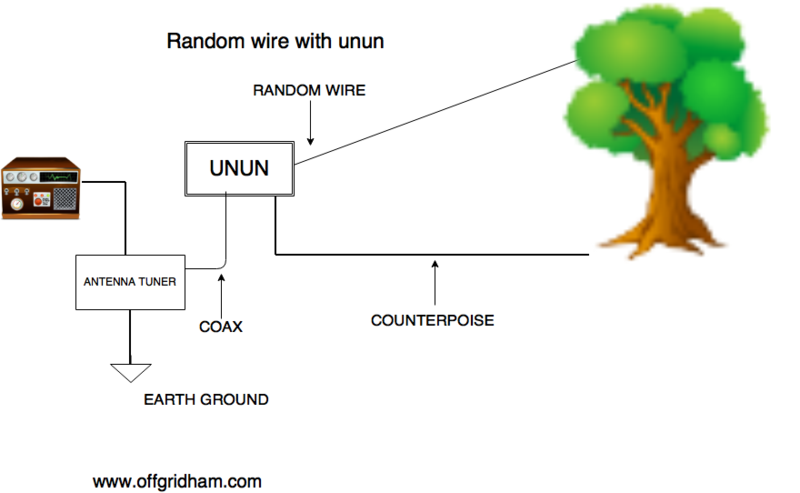 A unun is a simple transformer (photo 4) that matches an UNbalanced antenna to an UNbalanced feed line. This is not the same as a balun, which matches a BALanced antenna to an UNbalanced feed line. Digging into the particulars of ununs and baluns is more than we need to deal with right now; this topic will be covered in a future Off Grid Ham article. Suffice it to say that you need a unun to match a random wire antenna to a run of coax. Ununs are not expensive, and there are lots of plans out there if you want to make your own. Going on a power trip. Think about this: Running full power (100+ watts) in a portable application means you will also need a way to produce the power: A generator, lots of batteries, large solar panels, or whatever. If you’re going to drag all that stuff along, then you may as well bring a full size “real” antenna too. Why have all that power just to compromise on the antenna? To put it another way, a lightweight portable antenna is kind of pointless if all your other gear is clunky and heavy and hard to haul around. One of the reasons I like QRP is that the equipment is a fraction of the size and weight of full power radios with only minor givebacks in communications ability. Of course, you can push full power into the random wire portable antenna as long as you operate within the limits of your tuner and unun (and watch out for those hot spots!). Although Off Grid Ham is a strong advocate of QRP, I’m not here to talk anyone out of running however many watts they want. I’m only suggesting that radio amateurs carefully think through their priorities and decide if it’s worth the significant weight and space just to have a lot of watts. Few radio amateurs have only one radio, and so it is with antennas too. The random wire with a unun is my favorite, but I still use the hamsticks and wire dipoles in some situations because they offer better performance. The random wire with counterpoise (version 2) is a great option for backpacking/camping because it eliminates the need to bring a roll of coax but still gives good performance. The basic random wire (version 1, no counterpoise) is an “only if you must” choice. Commercially made portable antennas do work if you can afford them. Keep in mind that all portable antennas come with compromises. Regardless of what type of portable antenna you ultimately settle on, you’ll still want to have a random wire in your inventory. The flexibility and low cost make it an easy option. In an emergency, that simple wire may be your only link to the outside world. Great information! This is exactly what I need. This will be a perfect antenna for my FT-817ND when I’m out hiking/backpacking. As always, thanks Chris. Hi Mike, thanks for stopping by. Yes, the long wire is ideal for backpacking. I’m sure you’ll have great results with it. I’m glad I could help. Thank you very much. Off Grid Ham is for those who want to roll their sleeves up and go for it. I always try to make everything as practical and straightforward as possible so radio amateurs can actually do it instead of just reading about it. Thanks for your support & 73. Did you consider an off center fed dipole? I have one that is 65 feet long and will resonate on 40, 20, 10, and 6 meters. No tuner is needed. I have it on my roof supported on each end with coax hanging down from the balun. An 80m ocfd will resonate on more bands. You could support it with your two tripods and a pvc slotted pole in the middle. Hi Bill, thanks for visiting Off Grid Ham. I did consider an off center fed dipole but I wanted the flexibility of leaving the coax behind if needed, and it’s helpful to be able to use whatever length of wire is handy. But to your point, the off center fed dipole is a very effective antenna that is basically a more refined version of what i lay out in this article. Thanks again for coming by; I hope you’ll visit again and invite your friends. Hi Bob. Like you I experimented with various ideas until I came to the long wire. Chances are good that down the road I will find something else to replace it. I’m kind of flighty that way. It’s always helpful to have more than one portable antenna because there is no “one size fits all” solution. Thanks for stopping by Off Grid Ham. I hope you’ll come back and bring some friends with you. The same Lids that buy those outrageously priced Elecraft KX2/3 radios! Hi David, I’m not sure I would call them “lids” because everyone has their reasons for choosing their equipment, and those reasons are not always about money. Still, for most of us money is a main issue. I personally would not spend $900 (base price) on QRP radio that I have to put together myself, even if I could afford it! But would not fault anyone who does. We all got our “thing”. It’s all good. Thanks for stopping by Off Grid Ham. I hope you’ll visit again. I ended up using 53 ft. of fine wire. I use a push-up pole or one of the telescoping fishing poles the extend to 15-20 ft. I wrap the wire where the fishing line goes. I made a 9:1 Unun (QRP rated) which with the KX3 tuner I can cover 80-6 meters just fine. It also works as a walking stick for hiking to those remote spots. Thanks for the link, Kyle. I did check it out and it’s a great resource for anyone looking to make their own unun. As I mentioned in my article, ununs are relatively simple and many hams DIY. It’s a balanced antenna and doesn’t require an unun, but it does require a balanced tuner which I already have. While the original articl;e describes using ribbon cable, I’ve heard of people using speaker wire (or zip cord) with good results too. Dave brings up a good point…any antenna that is equal on both sides (radiator and counterpoise) and has a uniform feed line (such as ladder line or zip cord) is by definition a “balanced” antenna and does not need a unun. The random long wire is of course not the only game in town and we welcome other ideas. Thanks for stopping by Off Grid Ham. Please come again (or better yet, subscribe for email updates) and bring a few friends. Thanks for passing the tip along, Paul. I checked out the WB5CXC website and he has certainly put a lot of time into antenna research. Very good resource, thank you again. My antenna of choice for portable ops is 60′ of old #18 separated speaker wire, 30′ of haphazardly placed counterpoise of similar wire, and a homebrew L-network tuner. It loads and works fine on the pre-WARC bands 40-10 meters. No idea how it would play on 30, 17, or 12 meters. Don’t much care, as I don’t have those frequencies in my current equipment. The set up is simple, effective, and inexpensive. Works a charm with QRP. For higher power, one can beef up components accordingly. To paraphrase, why buy new when homebrew will more than do? Hi Jeff, and thanks for your input. 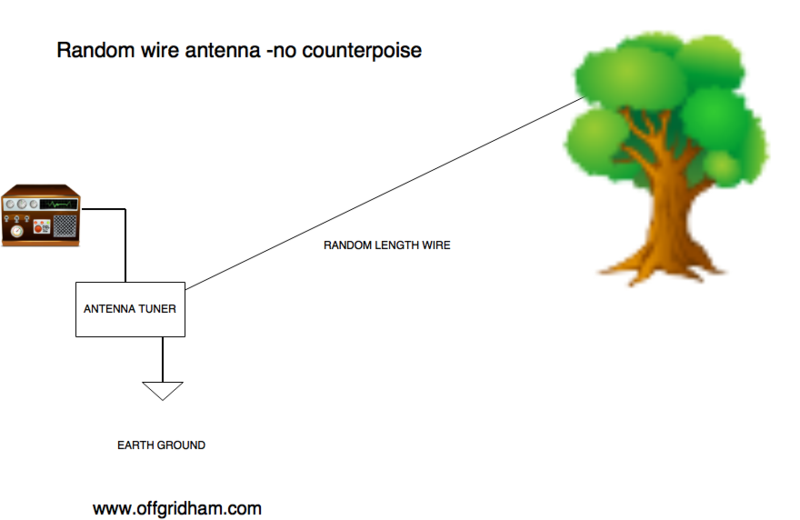 Your speaker wire antenna is an example of how simple antennas can be. Radio technology has made huge advancements but the basic physics of antennas is the same as always. By the way, for my other readers, Jeff is a well known amateur radio writer and personality. His website and other contributions are well worth your time to peruse. I built one when I was in Alaska and used it all over the place. The most expensive parts are the whips it uses for the ends of the antenna but, they have a source for them at $7.50 each in Oregon. Hi Paul, and thanks for your suggestion. I did look at the PDF in the link you provided. It is a very popular design that has been around for a long time and really does work. The ham stick dipoles I mentioned in my article are a variation on this. The only thing I would caution readers about is that although this homebrew Buddipole is very inexpensive to build, the article mentions that it requires antenna analyzer to tune it up. So an inexpensive antenna that needs a $350-plus instrument to make it work is kind of a wash. You’ll also have to bring the analyzer along to re-adjust the antenna any time there is a significant frequency change. There are two workarounds if you don’t have an antenna analyzer: 1) Tune for the middle of the band and let an antenna tuner make up the difference. 2) Through trial-and-error, adjust for lowest SWR using your radio’s built in SWR meter. The first option leaves you with an antenna not much better than a random wire, and the latter option can be a bit tedious. I’m not crapping on your idea, Paul, I just want to point out again what I mentioned in the article: all portable antennas come with compromises. I can appreciate modern electronic tools, antenna analyzers included. However, I often wonder how the heck we were able to build antennas – from simple dipoles to multiband yagis – way back when before the days of LSIC’s, computers, design software, analyzers, and such. And to top things off, more often than not, these antennas actually worked, contacts were made, and QSL cards were exchanged. After building the WN1MBK version of Lew McCoy’s Ultimate Transmatch back in the prehistoric 1970’s (it’s in the ARRL online archives for those interested), I loaded up all manner of crazy things metallic and made contacts on HF running well under 100 watts output. The shack was in the cellar, too, as was the transmatch. There weren’t any of those proverbial bedsprings in the cellar to load up, though I did load up an inverted wire coat hanger. And yes, the coat hanger both radiated and captured RF. Contacts were made. These little tidbits of radio fun history are what keep the magic alive.